In stock. Order in the next 14 hours, 6 minutes and it will go out today! Seeing a magician perform a chop cup routine in walk around performances can feel dated and unnatural due to the cumbersome nature of the prop. However, with the silicone chop cup, this problem is eradicated! This chop cup is a dream for every magician and a first class innovation. The cup is foldable and returns to normal size in no time. It's just a must have! 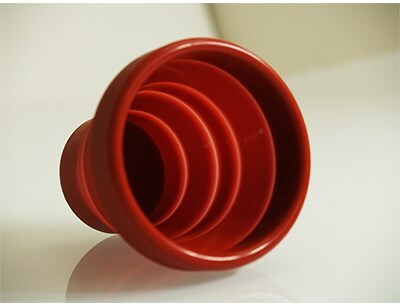 The silicone cup is folded very small in size and can easily be easily fit in the pocket of your jacket or pants, or even in the handkerchief pocket of your jacket. A nice touch is to put it in the box of a set of cards. This silicone harmonica chop cup is a highly professional magic prop and has a diameter of 6,4 cm (2,6 inch), is 7 cm high (2,8 inch) and weighs in at only 38 grams.